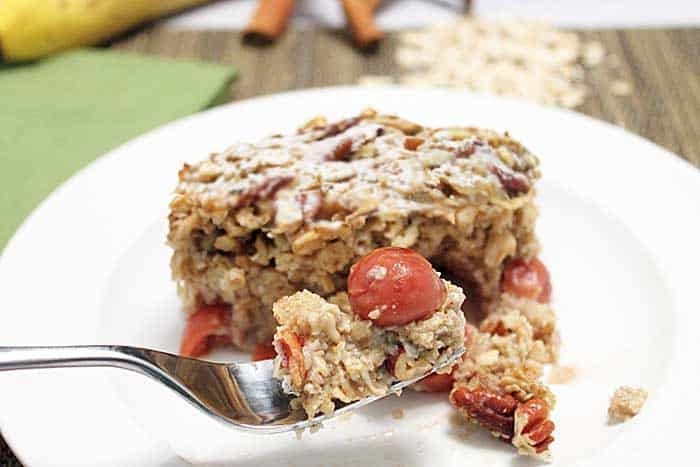 Easy & healthy Maple Bacon Oatmeal Bake is packed with bacon, bananas, cherries & chia seeds then flavored with a little maple syrup. It’s the perfect on-the-go breakfast & a delicious way to start to any day. You know those busy days when you are just rushing to get to work on time or get the kids off to school and there is just no time to whip up a healthy breakfast? Well, I figured there had to be a way to make that all important breakfast quickly and easily and one that would taste delicious too. So I set out to create a recipe that would do just that. 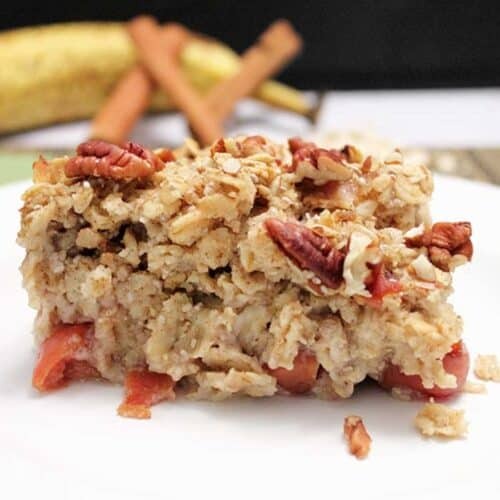 Quick & easy Maple Bacon Oatmeal Bake perfect for on-the-go. 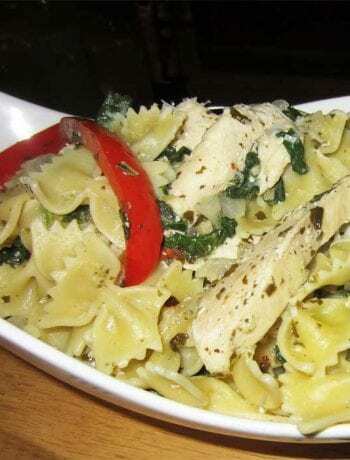 I decided to tackle two challenges in one recipe. Not only did I want to find a way to make a quick breakfast but I wanted to make it with oatmeal too. Now I bet you are wondering what the second challenge is. OK, here it is and I’m being honest here, I do not like oatmeal. There I said it! OK, that is not exactly true since I love oatmeal cookies and granola but I’m talking hot oatmeal here. 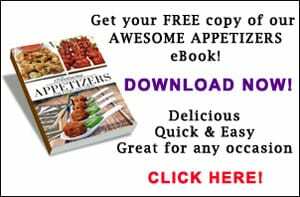 Everyone is probably going “What!” but it’s so good for you! Which is exactly the reason I wanted to take the challenge on and make the oatmeal so good that I would finally become a fan! And I actually did it! In fact, my husband, who is also is not very fond of oatmeal, said it was delicious! (a little pat on the back for myself on this one) And you don’t have to tell them how good it is for them, just let them enjoy it. I like knowing that oats and other whole grains have a special fiber called beta-glucan that can aid in reducing cholesterol. 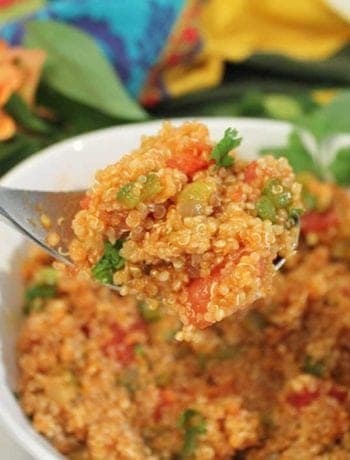 This fiber also has antioxidant compounds that reduce the risk of heart disease and enhance the immune system especially if eaten six times per week. OK, I can do that! Just a few easy steps to a delicious healthy breakfast. First spray an 8×8-inch baking dish with nonstick spray. Mix the oatmeal, chia seeds, pecans, bacon and seasonings in a bowl. Mix maple syrup, milk, eggs, butter and vanilla in another bowl. 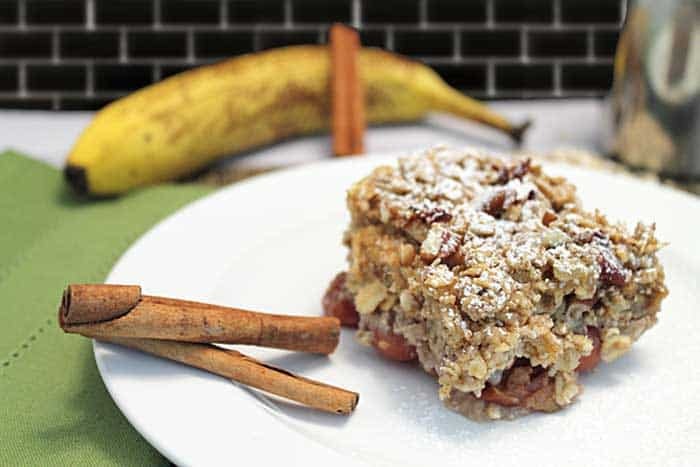 Place a layer of bananas on the bottom. Layer cherries on top of bananas. Finish by sprinkling oatmeal mixture on top of cherries, topping with milk-egg mixture then sprinkling a few extra pecans on top. Bake. Here you can dust with some powdered sugar or leave it as is. Now take a bite. Ummmm! 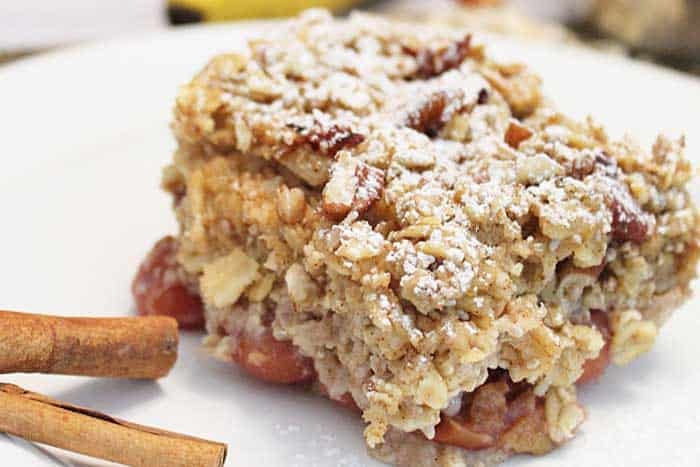 You’ll find the rich layer of oatmeal has a lovely maple flavor with a bit of a salty taste from the bacon and an extra crunch from the nuts. This is all sweetened by the layer of fruits on the bottom. 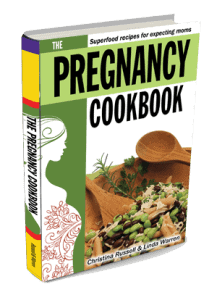 It has everything your body needs for a healthy breakfast. 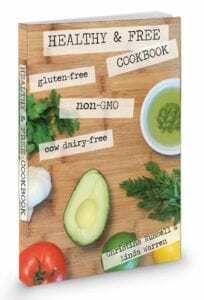 And, it can be dairy-free with the use of almond or cashew milk and, if you leave off the bacon, vegetarian as well. 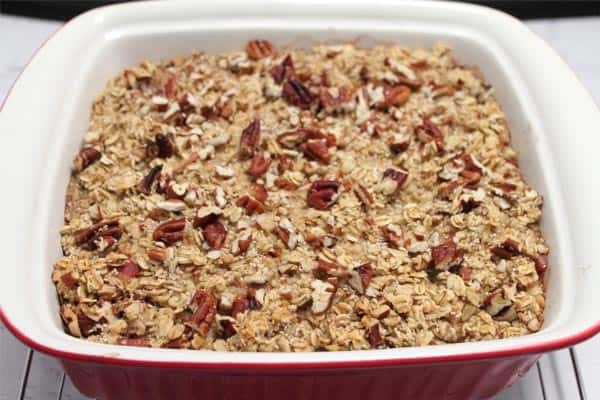 This oatmeal bake works great as an on-the-go breakfast that can last all wee, Just cut the oatmeal bake into squares and wrap them in oil or plastic wrap then freeze. To serve, just heat it in a microwave for 1-1/2 to 2 minutes and you have a delicious hot oatmeal breakfast all over again. You can eat it cold as well but I think it’s much better warmed up. You can also opt to use different fruit in place of the cherries. I think apples or blueberries would be fantastic subs. It’s oatmeal your way! 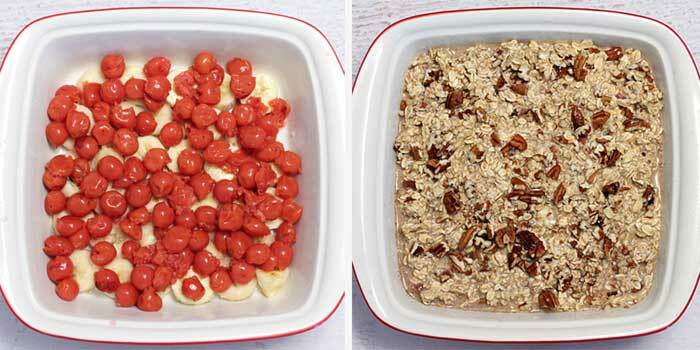 An easy and healthy oatmeal casserole for on-the-go breakfasts. Flavored with maple syrup, bacon & a layer of fruit, it's a delicious way to start any day. Preheat oven to 375 degrees. Place rack in top third of oven. Spray an 8×8-inch baking dish with non-stick cooking spray. 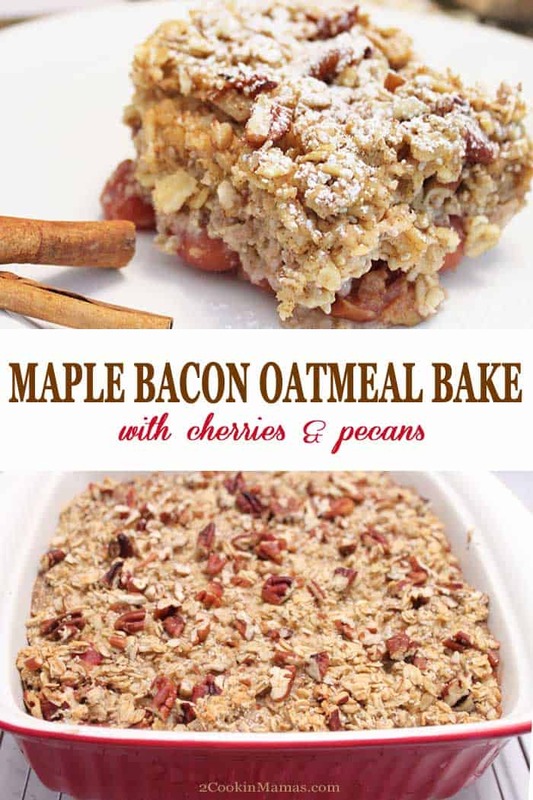 In a large bowl, combine oats, 1/4 cup pecans, chia seeds, baking powder, cinnamon, salt and bacon. In a small bowl, mix maple syrup, milk, egg, butter and vanilla and whisk until well combined. 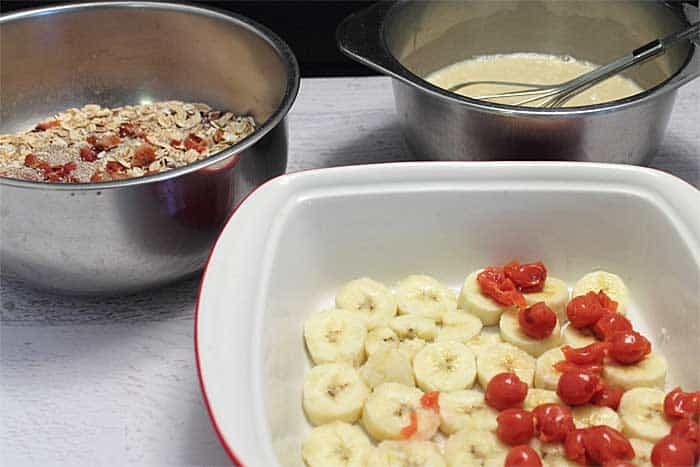 To assemble: Line bottom of baking dish with banana slices. Pour cherries over bananas. Cover with oat mixture then drizzle maple syrup-milk mixture over all. Sprinkle remaining 1/4 cup pecans on top. Bake for 35-45 minutes. Just before serving dust with powdered sugar.